And so, the end is nigh! The end of our amazing round-the-world trip that is. We depart for Frankfurt on Wednesday afternoon, arriving Thursday morning, and a few hours later fly over to Manchester. We’ve both really enjoyed Boston, especially the snow that fell on Sunday. We haven’t managed to cover all of the tourist sites we had hoped, but maybe we’ll be back in the future to visit those when it’s a bit warmer. We’ve been up to Harvard and also MIT in Cambridge where we visited the MIT Museum. We walked round Boston Common in the snow on Sunday and visited the location of the “Cheers” bar. On Tuesday we went to the Science Museum to visit the Star Wars: Where Science Meets Imagination exhibition and also did the “Jump to Light Speed” in the Milllenium Falcon cockpit mock-up. Along with all that we did lots of shopping at the various discount stores in Boston, so I’m now well supplied with jeans, a new suit and coat. Not sure when I’ll get to post again as we’re returning to my parents’ house in Cleethorpes for a while and then on to Vic’s folks in Bury St Edmunds. Difficult to believe we’re finally returning to the UK, over 16 months since we left. We’ve had a fantastic time travelling and would recommend it to anyone. There’s so much out there to see, we only managed to see some of the things we wanted to. As you travel you hear about so many others things which would be great to do/see but time and budget are limited so we had to do what we could manage. Now we have to work out what we’re going to next! Jobs and accommodation, I guess. We’ve been in Boston since Wednesday and the weather forecast has been getting colder. Since Thursday they’ve been predicting a Nor’Easter and last night it started. It’s now been declared The Blizzard of 2006 and there’s been around twelve inches of snow here in Downtown Boston. I haven’t seen this much snow in ages, if ever. We’re staying at the Omni Parker House which is nice and warm. We’re flying back to the UK on Wednesday/Thursday this week, so I’ll try to update the blog with our Boston activities before then. Meanwhile you can take a look at the Boston photos so far. Chicago has been experiencing unseasonably warm weather for the past month. When we checked the weather from New Zealand back in mid-December it was 0 Fahrenheit (-18C) but on arrival it was around 40F (8C). The forecast indicated that the cold was to return over the weekend after we arrived though and so it proved. On Saturday it snowed lightly and the temperature outside was a bracing 28F (-2C) before windchill. Our hotel room was very comfortable, and we were paying only around $65 per night through Hotwire. As is so often the case, the upmarket hotels sting you on virtually every “extra”. A can of Pepsi from the mini-bar comes to $4.23 (well over 2 pounds!). Internet access, which had been free at the Econolodge and Best Western was around $12 per day. The Hyatt Regency Chicago has 2019 room and over 100 suites, making it one of the largest hotels in the world (outside Las Vegas anyway). The front desk was upstairs from the entrance, above a nightclub area called HardDrive and a bar/restaurant called Network. Check-in was all electronic, swiping my credit card in a machine and being given two room keycards in return. Great view north over the river from the room, so we can see the John Hancock Tower, the NBC Building and lots of other Chicago landmarks. On Friday we braved the cold and went down to State Street in The Loop to check out the shops and restaurants. The big department store here, Marshall Field’s was having a special 2-day sale so Vic checked out the footware department there. Sadly there wasn’t anything she liked and the prices weren’t as good as the discount shoe shops we’d visited in San Francisco and other stores in Chicago. 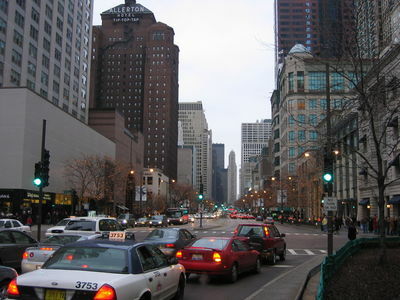 Saturday, we walked up the Magnificent Mile as Michigan Avenue is called just north of the river. We popped into the Apple Store and checked our email etc, and I bought a “returned” battery for my Apple Powerbook at almost half the usual price. Lots of other “returned” bargains were to be had including some of the new Intel Core Duo iMacs and some iPod nanos. We had a nasty shock when someone stole all the cash from Vic’s purse which was in her handbag while she was in H&M. They must have reached in while she was distracted and pulled the cash out as no cards etc were touched. Fortunately she only had $50 or so cash (plus $20 from New Zealand), but it was still an unpleasant experience. Walking up the Magnificent Mile we passed the huge John Hancock Tower, the Water Tower and lots of other great buildings. Chicago seems to have taken more pride and care with the buildings in the city, with some of the most architecturally interesting and elegant skyscrapers I’ve seen. As darkness set in we walked through the snow to Navy Pier, which was almost as tacky as Pier 39 in San Francisco. We had a pretty disappointing meal at an Italian restaurant there and then walked back to the hotel. On Sunday we walked through the splendid Millenium Park, past the stunning Cloud Gate sculpture created by Anish Kapoor, and the strange Crown Fountain before heading West and then up the Sears Tower for some fantastic views over the city, followed by an excellent Chicago-style pizza pie. Our roomette was cosy, two seats facing each other with as pull-out table in between. At nighttime the seats fold down into a lower bunk and the upper bunk pulls down form the ceiling. Our Sleeping Car Attendant was a great lady called Sandy who took care of us for the 61 hours of the journey, making our beds while we were having dinner and folding them away while we were at breakfast. Our tickets and the price of the roomette came to $512, which is 290 pounds. That price included all meals and drinks (excluding alcohol), bed linen, towels, access to a shared shower and toilet, and use of the Lounge Car. The journey was due to last from 9.15am Pacific Time through to 3.05pm Central Time, with the train passing through the entire Mountain Time timezone as well. Early in the journey we got stuck behind a slow freight train (freight always takes priority over passenger trains on the US rail system), and by the time we reached Reno, Nevada at 6pm on Tuesday evening we were already 2 hours behind schedule. Passing through the Sierra Nevada mountains was great, the ground was covered in snow and the scenery was beautiful. During Tuesday night/Wednesday morning we passed through Salt Lake City, Utah. Entering Colorado around noon on Wednesday we stopped at Grand Junction where Vic and I got out to stretch our legs and walk in the falling snow. I think that’s the first fresh snow we’ve been in since Winter 2003/2004 back in the UK. Colorado was great for scenery, lots of canyons of red rock and snowy trails. By the time the sun set on Wednesday we were about 3 and a half hours behind schedule which meant that we passed through the Rocky Mountains in the dark, reaching Denver at about 11pm. Waking the next morning we were in Nebraska and passed through Lincoln while having breakfast. The landscape was very different from Colorado, being flat prairie surrounded by distant hills, and on entering Iowa mid-morning the land was flatter than we’d seen in a while and the snow petered out. We finally reached Chicago, Illinois at 8.15pm, just over 5 hours later than scheduled. That fouled up a lot of plans for other passengers but Amtrak seemed to take care of them, arranging accomodation and alternative transport. We just caught a taxi to the Hyatt Regency on Wacker Drive where we had booked a room for our stay through HotWire. On Tuesday morning we drove over to Daly City where Vic’s Great-Uncle James lives. We dropped off our bags at his house there and then set off to the airport to drop off the car. Only one slight navigational problem and we delivered the car on time. We then caught the BART train into San Francisco using tickets which James had kindly purchased for us. We arrived on Market Street in the centre of the city and wandered around the area and up to Union Square, visiting some of the big stores in the area. Vic was looking for some boots so we visited lots of shoe shops, most of which had boot sales on with 50% or greater reductions on pairs of boots. The afternoon and early evening was spent taking in the atmosphere of the city. SF was cooler, temperature-wise, then LA, and most days that we were there it was overcast, but it still wasn’t much like winter back in the UK. We ate out in the city and then caught the BART back to Daly City. Vic’s Great Uncle James has lived in SF for around 50 years so had a wealth of knowledge to pass on and during the week we spent in San Francisco he helped us enormously with guidance, taking us on tours of the Golden Gate Bridge and Sausalito and other places of interest in the city. He was also very entertaining and hospitable, taking us to some great places for breakfast each day and meals on many of the evenings. We visited quite a lot of the usual tourist sights while in San Francisco, including the Golden Gate Bridge, Chinatown, Fisherman’s Wharf, tacky Pier 39, Union Square, the Wells Fargo Museum, City Lights bookshop in North Beach, the Palace of Fine Arts, Fort Funston and the Davis Battery as well as a 4 hour trip to Alcatraz. Alcatraz was very interesting, and we were lucky enough to catch a talk by one of the Park Rangers on the various escape attempts over the years that the island was in use as a prison. Only one man is known to have survived the swim from Alcatraz to the shore and he was immediately recaptured and returned to the island (with pretty severe hypothermia!). Several other escapees disappeared during attempts and are presumed to have perished, but may have made it to shore safely, though that’s pretty unlikely given the cold of the water and strength of the currents during their escapes. A week seemed to pass very quickly in SF, we enjoyed ourselves enormously, and bought a few items in preparation for the forthcoming cold weather of Chicago and Boston. We had booked a roomette on the California Zephyr train from Emeryville near San Francisco through to Chicago leaving at 9.15am on Tuesday 31st January, so couldn’t extend our stay however much we would have liked to. I’ve uploaded all highlights of the photos from San Francisco. We were leaving LA on Saturday so Claire took us to John Wayne Airport in Orange County where we picked up a hire car. From there Vic navigated us to highway 405 and then on to Highway 1, the Pacific Coast Highway, and from there we drove for around 4 hours to San Luis Obispo where we had booked at room at the Econolodge. The room was great, with free high-speed internet access, two bedrooms, a fridge, microwave and two TVs. On Sunday we had breakfast in San Luis Obispo and then made our way about 40 miles further on to Hearst Castle, the former home of the multi-millionaire William Randolph Hearst. After parking at the Visitors Center, we picked up our pre-booked tour tickets. There are 4 daytime tours of the castle and one night-time tour (at certain times of year). Each tour is around an hour and a half long and costs $20 per person. We caught the bus up to the castle with the rest of our tour group, passing through the enormous grounds of the house which at one time were used as a private zoo with bears, tigers etc. There are still goats, cattle and zebra roaming the estate. On arrival we disembarked and walked up the steps to the outdoor swimming pool, surrounded by a classical temple building which included some ancient art works collected by Mr Hearst. The pool is built on on a cantilever basis which means that even during an earthquake the structure remains undamaged. From here you can see down to the Pacific Ocean and North to the boundary of the grounds many miles distant. Next was a tour through one of the guest houses, again richly decorated with art works collected by Mr Hearst. We walked through the garden to the front of the main building, styled like a Mediterranean cathedral, and in through an entrance to the main reception area. This was hung on all walls by huge tapestries and paintings, as well as having statues in each corner. An evenings entertainment at Hearst Castle would have begun here, and the guide listed many of the famous people who had stayed at the castle. The dining room was next, decorated with many works of silver and flags from Europe. Passing through here we went back outside and around under the tennis courts to the huge indoor swimming pool. This was richly decorated in dark blue tiles and gold leaf, and is ten feet deep throughout. There is a diving platform in the middle of the room reached by hidden staircases, as well as a lower diving board at the end of the pool. That concluded our tour and we returned to the bus and then to the Visitors Center. Other tours include the castle library, the apartments in the main building and a variety of other areas. Our tour gave a good introduction to the building and to the extravagant opulent lifestyle of one of the worlds richest men during the 1930-50’s when he lived there. Heading off back onto Highway 1, a few miles down the road we spotted a group of people looking over a cliff onto the seashore so pulled over at a parking spot. We were greeted by the sight of hundreds, if not thousands, of elephant seals who come to the area to breed. There were hundreds pulled up on to the beach, some with new-born pups, others flicking sand on themselves to keep cool. There were huge males with large noses fighting for space and status. Around the fence at the top of the cliff, small black birds hopped around close to the visitors, while down on the beach seagulls scavenged for any scraps they could find. An amazing sight to come across by accident and one of the highlights of our Pacific Coast trip. After that we pressed on with our journey, heading up to the Big Sur area, driving along some beautiful coast line, and catching a fabulous sunset before finally reaching our destination for the night. We had a cabin at Big Sur River Inn, pricey at $125+tax but that included dinner and breakfast at the restaurant attached to the Inn. The room didn’t have a TV, the receptionist said that none of the hotels there had TV as there was no reception, but we found that there was a TV in the restaurant bar, so we’re not sure how that all worked. The next morning we headed to Monterey, and stopped there for a few hours to watch the sea-lions playing in the harbour and for a spot of lunch. We had a room booked at a Best Western hotel near to San Francisco airport and so arrived there late afternoon on the Monday and relaxed in the very comfortable room. Photos from the Pacific Coast Highway trip.